This Easter Sunday Bryan and I participated in a kayak tour around Back Bay in Newport. 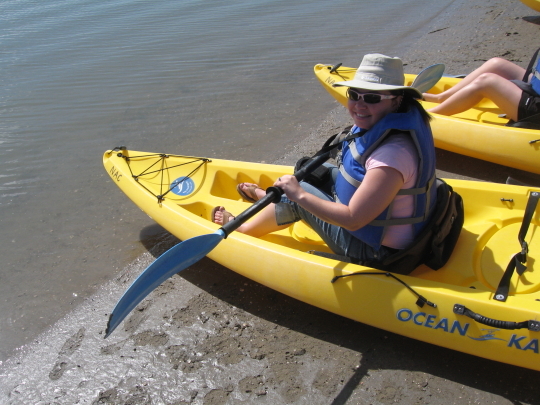 I had found out about this guided kayak tour through the Irvine Ranch Wildlands website. We met our group and our tour guides Peter and Holly at the Newport Aquatic Center at 10am. 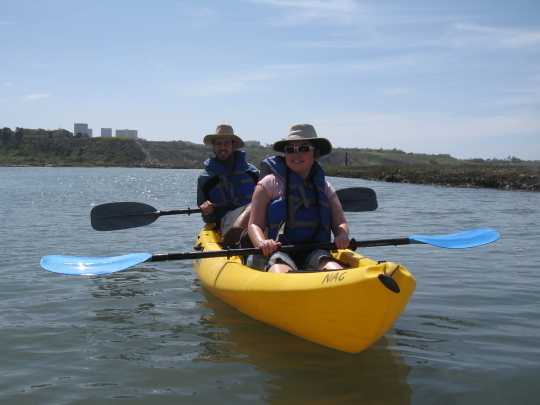 Peter and Holly both volunteer for the Newport Bay Naturalists & Friends and are avid kayakers. 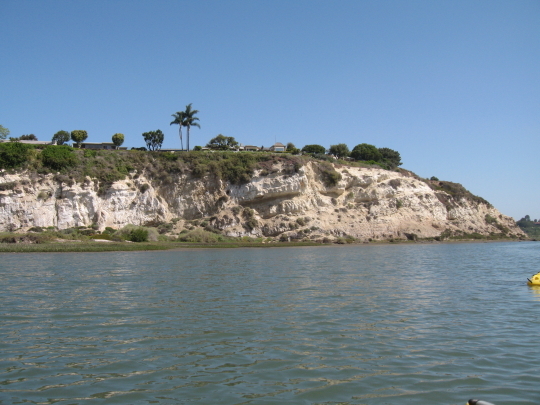 They explained to us the history of Back Bay or Upper Newport Bay which existed because residents in the area took actions to save it from being developed by a high profile real estate company. The bay is home to many animals including an array of birds which Peter and Holly told us all about. We took about an hour to paddle halfway down the bay. It was very easy to paddle on the way out because we were going with the tide however, on the way back it was more difficult. Bryan used his mad paddling skills to get us back to shore pretty quickly. I helped with the paddling but I could never get my technique right and I really didn’t have that much arm strength to begin with. It was a beautiful clear day outside and perfect weather to kayak in. Our group consisted of two other couples along with Peter and Holly. The only thing I wasn’t anticipating was getting wet. 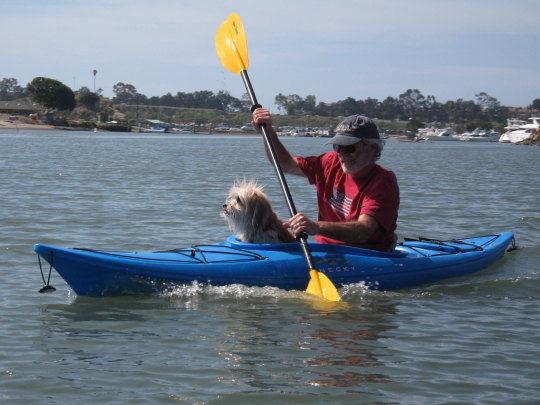 Although we didn’t tip over, as I anticipated, the paddling motion allowed for water to splash into our kayak. I was pretty much soaked from the waist down when I got to shore. I am glad that I chose to bring my little SD550 camera along to capture some photos. Back Bay is really a beautiful place and I was lucky enough to get Holly to take a photo of us. This was our first time kayaking so as you might expect our arms are very sore but it was definitely worth the whole experience. About to embark on my first kayak adventure. Can you see the fear?